Last night I watched the first two episodes of the BBC series Life. If you haven't seen it, it's about the lengths to which animals will go to survive. My friend Shannon had warned me about the program. She said that every segment tells a little story. First, they make you fall in love with an animal, and then they kill it. Two boxes of kleenex later, I realize she was right. In the program, they showed the Chinstrap mothers leaving their babies after feeding them for the last time. The baby penguins, now alone, know that their only chance of survival is to make it out to open water. So off they waddle towards the ocean. Of course, BBC is careful to show the most adorable ones - the penguins with a bit of baby down still attached to the top of their heads, or the particularly uncoordinated ones whose mishaps warm your heart, just a little. Bravely they stand at the ocean's edge and plop sweetly into the water. Ahead of them is some pack ice which they must navigate first before they reach the relative safety of the open water. 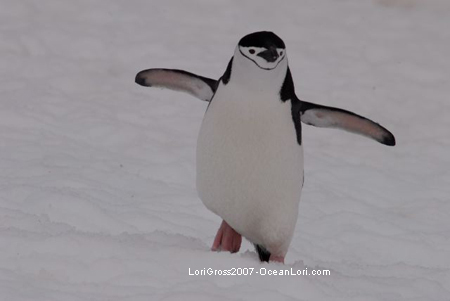 One of the fluffiest Chinstraps decides to lead the way, innocently bobbing along in the ice floe. But danger is lurking just ahead. 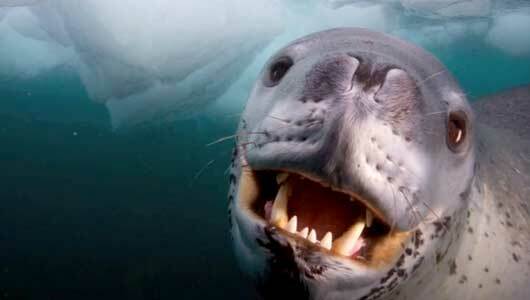 This is the leopard seal, and it's got a face only a mother could love. Quick as lightning, the leopard seal appears out of nowhere. The baby Chinstrap doesn't have a chance. It flaps furiously, but it's awkward little wings are no match for the gaping jaws of the seal. 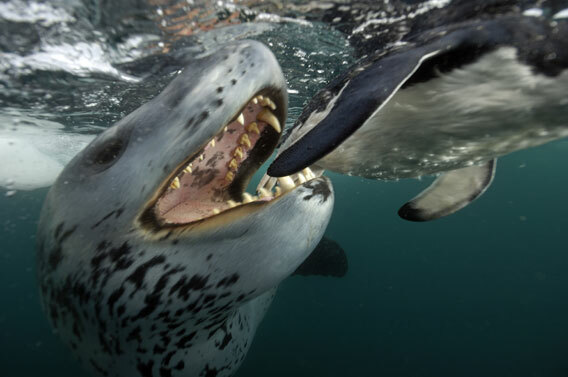 I would like to say that the horrible ordeal is over with quickly, but it appears the leopard seal likes to play with its food. For the next minute the chinstrap penguin is tossed back and forth, until finally it succumbs. The last we see of the penguin is its half-eaten carcass falling to the bottom of the ocean bed. Meanwhile I'm a blubbering idiot, and seriously considering an expedition to Antarctica to club some seals. BBC's Life is beautifully filmed and very informative. But it's hardly upbeat and fun. So, to end this post on a positive note, I'm including a clip from one of my other favorite documentaries, Animals Are Beautiful People, by Jamie Uys. I’m glad you showed this rather than a clip of the seals. The sound effects remind me of the Carry On films. I have to confess, I know exactly how these poor animals feel. Well, that video clip certainly balanced things out. Although I reckon the animals in the video weren't feeling particularly balanced. The BBC do an excellent job when it comes to wildlife documentaries. Anyway, I must go for a lie down. I feel most sorry for the monkey at the end of the clip, holding his head as the sun rises. I know exactly how he feels!